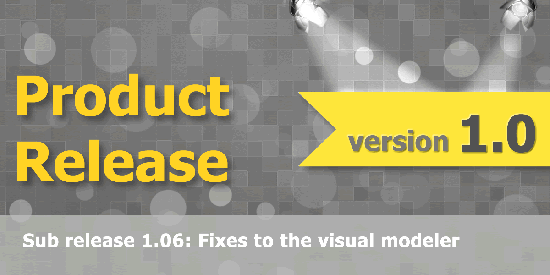 Today we released of version 1.06. Fixed stubborn bug in our visual modeler around border-thickness using IE. This was/is really an IE browser limitation but we found a solid work-around that resolved the issue once and for all. - improved the responsive design of the visual modeler: auto sizing of the diagram, a minor bug inside the zoom slider, improvements of the visual behaviour of the side menus inside the visual modeler. Several minor UI tweaks, further improvements of responsive design so that listviews are better auto sizing to page sizes.